HeartSupport runs a lean organization that operates with only seven staff members and two campaigns a year. Yet, this small group is a powerhouse when it comes to their development success. Using strategic fundraising tactics, they bring in enough to sustain day-to-day operations while simultaneously fueling their program growth. 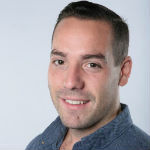 To dig into what makes this particular campaign such a knockout, we sat down with Ben Sledge, the director at HeartSupport, to discuss its origin story and five ways they build its results year-over-year. Every day, HeartSupport works to equip, encourage, inform, and provide emotional support to young adults caught in cycles of addiction, suicide, depression, and abuse. Having headlined Vans Warped Tour himself, HeartSupport founder Jake Luhrs realized the festival was a place where the organization could have a large impact to advance this mission. That is, it presented an opportunity to be on the ground, directly planted next to the people who could benefit from the organization’s services. “This is an impact we make on the lives of millennials that are going through suicide, addiction, depression, and more. We’ve seen hundreds of people who have had their lives transformed because of our presence there. 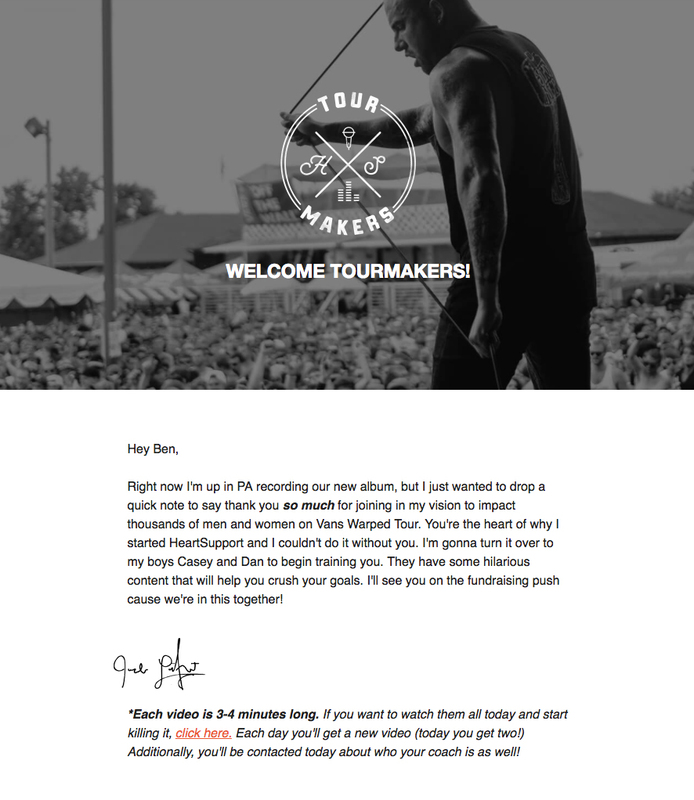 At the same time, Vans Warped Tour is an opportunity to engage with people who support the organization, or might want to once learning more about HeartSupport. The organization raises awareness for their programs, provides on the ground counseling, and connects concertgoers to the HeartSupport community. Further, when HeartSupport polled their audience and asked where people initially discovered their organization, the overwhelming response was at Warped Tour. HeartSupport is adept at engaging with millennials through their Tourmakers campaign, which is important because millennials are the up and coming dominant force in philanthropy. For example, their incentives are geared directly at what millennials enjoy both recreationally and with regard to the charitable impact of their dollar. 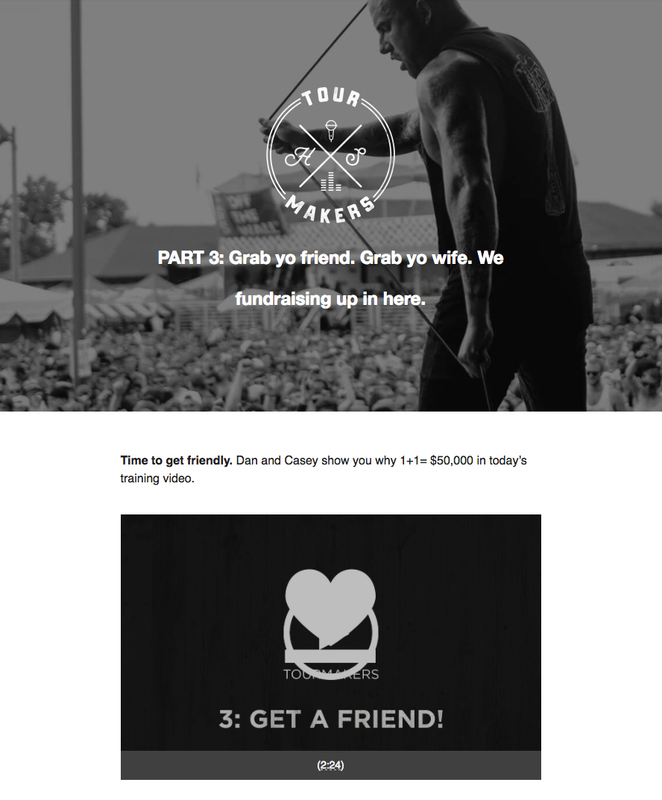 Every fundraiser who hits their goal gets a ticket to attend Vans Warped Tour. And while HeartSupport doesn’t require that these fundraisers serve at their tent during the festival, they encourage them to come by, talk with people, and see exactly how their money creates an impact. “The fundraising creates a sense of purpose—you’re serving something bigger than yourself. Our fundraisers get to see all of this and say: I got to do that. I helped. Being on the ground in-person also makes HeartSupport’s mission tangible for the fundraisers. According to Sledge, it makes them feel more invested in the cause, and they ultimately become more valuable to the community as a whole. This dedicated attention to each fundraiser is one of the reasons they get so many repeat fundraisers year-over-year. That retention also gives HeartSupport the confidence they need to comfortably increase their fundraising goal. This marks the third consecutive year they’ve increased their goal by $10,000. 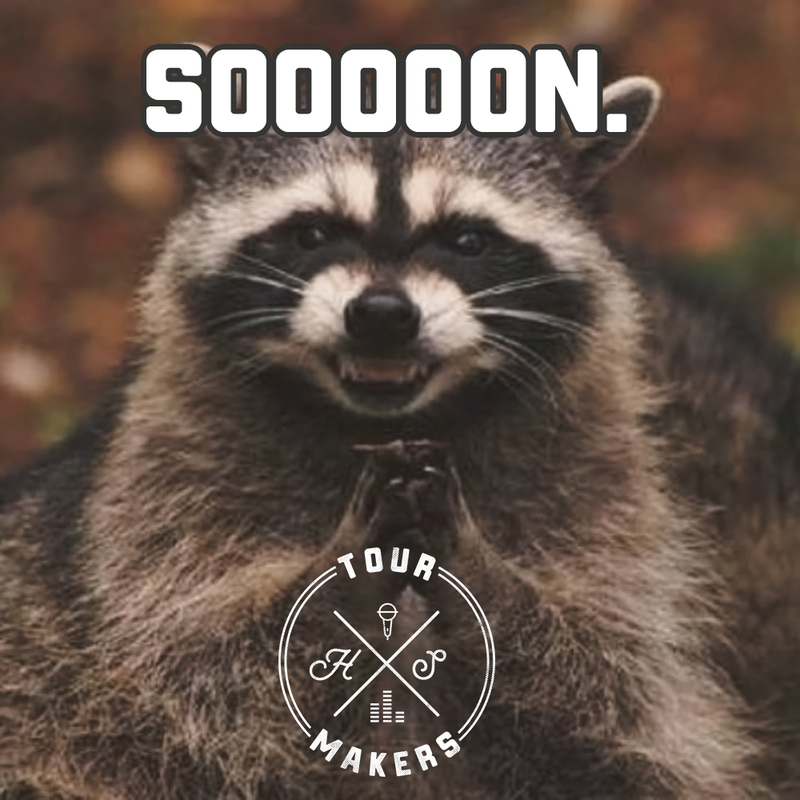 In its first year, Tourmakers sought to fundraise $30,000 in 30 days. HeartSupport had pursued this 30 by 30 model in the past for holiday fundraising with success and thought it might prove effective during a mid-year campaign. However, they found it difficult to gain the same momentum. They encountered the infamous mid-campaign lull. In light of this experience, HeartSupport now runs Tourmakers over the course of one week to create a heightened sense of urgency. “Asking people for money for 30 days is difficult. I don’t want to do that. It’s horrible. Instead, we rely on a short sprint. Yet an effective short sprint requires the right preparation and execution. Sledge, former military, is a fan of the serviceman’s mantra: “prior planning prevents poor performance.” For HeartSupport, that means the more planning they do ahead of time, the more effective Tourmakers will be. For example, they recruit fundraisers 2 to 3 weeks before the campaign starts to educate them on fundraising. For their 2017 campaign, they have 162 fundraisers going through the process of email and video coaching. One of the coaching emails HeartSupport sends fundraisers with an embedded video. HeartSupport also anticipates the mid-campaign lull and plans accordingly to avoid a loss of momentum. As Tourmakers typically launches on a Monday, Sledge plans to unveil a matching gift to reignite the passion in their fundraisers on Wednesday. All fundraisers are informed that any amount raised will be matched to double their results. This pulls the campaign out of the lull and sets it up for success over the remaining days. Fundraisers enter Thursday invigorated by the one-day matching gift period, and they’re fueled by the fact that the finish line is within sight. On Friday, fundraisers see that their goal is close, and with encouragement from the HeartSupport team, power through to the end of the campaign. Another key component of their year-over-year growth is the education they provide fundraisers. Every participant receives coaching and instructional onboarding videos around effective fundraising tactics. The end goal of this personalized approach is to impart confidence and have each fundraiser feel empowered to meet their fundraising goals. “There’s a lot of fear for people fundraising. What if people say no? What if I don’t hit my goal? The whole mission of HeartSupport is overcoming fear, finding purpose, and healing. When our fundraisers set out and risk facing rejection, that builds confidence. HeartSupport finds that this individualized approach to coaching really pays off. In one case, Sledge spoke with a young woman struggling to bring in donations during Tourmakers. After taking the time to personally coach her through a few tips, she secured a $500 donation that same afternoon. Further, the HeartSupport team and community was so celebratory of her success that she decided to up her fundraising goal to $1,000. With newfound confidence, she met her goal by the campaign’s end. “We wouldn’t be good at our jobs if we said you’re going to raise money, and we’re not going to talk to you about it. Instead, we tell people you’re not going to be alone, you will have a coach. We only have seven staffers, but we’re going to hit the ground running and kill it with you. Aside from dedicated coaching, HeartSupport also makes the design of their campaign a top priority. Their pages feature relevant color schemes, high resolution photos, and well-written copy. They want their impact to be clear on every page, which is why they make heavy use of visuals and beneficiary testimonials. 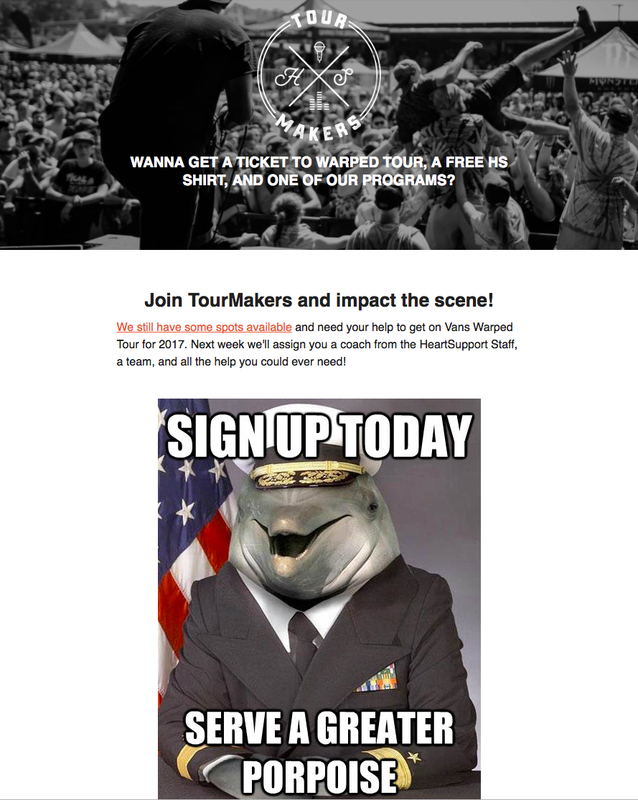 Standing front and center on the Tourmakers page is a short video of one of their beneficiaries. She details her experience meeting HeartSupport at Vans Warped Tour and how the organization’s services saved her life. She now participates in the HeartSupport tent each year on the tour and gives back by sharing her experience. Sledge and the team also strive to bring a sense of authenticity and trust to their campaign page. To that end they use professional photos of their time on the road with Warped Tour coupled with touches of “social proof.” For example, they highlight their nomination as one of the Classy Awards Finalists, which creates an additional layer of professionalism in the public’s eye. HeartSupport proudly displays their nomination as a Classy Awards finalist on their Tourmakers campaign page. By investing in the look and feel of their campaign, they’re able to boost credibility, drive donations, and successfully tell a strong story. Without strong communication plans, Tourmakers would fall apart. It’s why HeartSupport is adamant about using Classy’s built-in communication features to keep their fundraisers engaged and motivated. To keep the energy high, they make sure to have fun with it. The email below to potential fundraisers uses a fun meme and pun to delight readers. When peer-to-peer fundraisers sign up, they immediately get emails from HeartSupport about getting started. One of the emails is a note from Luhrs thanking them for their support and letting them know what’s next. There’s also a heavy push on the social media side of things to promote the campaign. Once again, they make heavy use of memes and clever content to delight and engage supporters. When you keep fundraisers engaged every step of the way, it builds strong relationships between all involved. Fundraisers aren’t just strangers supporting a cause together—they become a family. Even people who don’t reach their fundraising goal are inspired to come back and participate the following year to remain involved in the community and try again. Commitment to further cultivating relationships. These efforts create a group of devoted individuals ready to support their programs year after year. If you plan on attending Vans Warped Tour this year, be sure to stop by the HeartSupport tent and see their work with your own eyes.